After announcing a political film titled Rajavari Chepala Cheruvu, he has come up with so many films but made Lakshmi’s NTR finally. And then he has come up with the idea of later TN CM Jayalalitha’s friend Sasikala’s biopic. And now, he got another tune to sing. We are talking about Ram Gopal Varma whose announced list of films through title posters is actually more in number than the total films he has directed so far. And now, he’s announcing that “Tiger KCR” is his upcoming film. 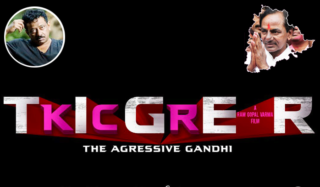 “It is a biopic of KTR’s father from the time he couldn’t bear the 3rd class treatment being given to Telangana people by the Andhras, and how he fought in a fiery way to achieve Telangana state”, he tweeted, sharing a pic of the title poster. Well, with Varma being an Andhraite and calling that Andhras have insulted KCR sounds like a joke, but still, the maverick director is claiming that he will showcase some truths in this film as well. We have to see if the film will take off or not. Next articleBut for Modi, Naidu would have been in Oppn!